I always used to love cottage cheese and I only just found a good vegan alternative. Most vegan recipes use silken tofu, but I much prefer this version with regular firm tofu and unsweetened soy yogurt. It is has exactly the right texture and a lovely slightly savory, salty and sour flavor. It is also quite cheap and super quick to make! 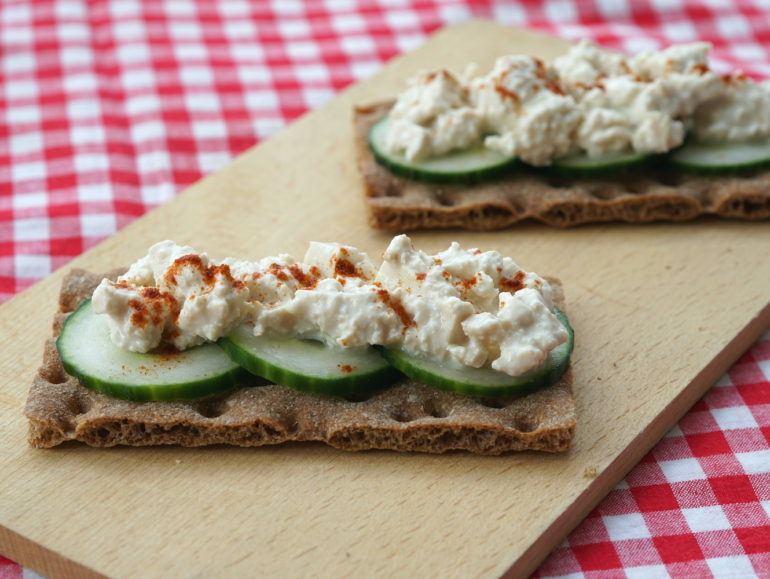 This vegan cottage cheese is very high in protein and low in carbs. I like to eat it on crackers, in lettuce wraps, as a dip with some veggies, or just with a spoon! It's also great in casseroles. Anything you can do with cow's milk cottage cheese, you can do with this recipe. It is essential to use unsweetened yogurt. Alpro Mild&Creamy works well, or you can try a local brand. If no unsweetened vegan yoghurt is sold near you, try making your own from soy milk and/or nuts. There are many recipes floating around. Yoghurt is a wonderful food to have in your fridge, especially when eating low carb. Crumble up the tofu with your hands, so it resembles the texture of cottage cheese with smaller and larger pieces. Wrap the crumbles in a clean tea towel or cheesecloth and squeeze the excess liquid uit of it. In a bowl, mix the tofu with the soy yogurt, salt, nutritional yeast and lemon juice. Store in the fridge to marinate. You can eat it right away, but it will taste better the next day. The cottage cheese will keep in the fridge for at least five days. Made it with So Delicious coconut yogurt. Loving it! Just had to comment again because I am so addicted to this. When my batch was gone all I could think about was making more, so today I made more and still love it.